Richard Irwin (Belper, United Kingdom) on 15 February 2008 in Plant & Nature. 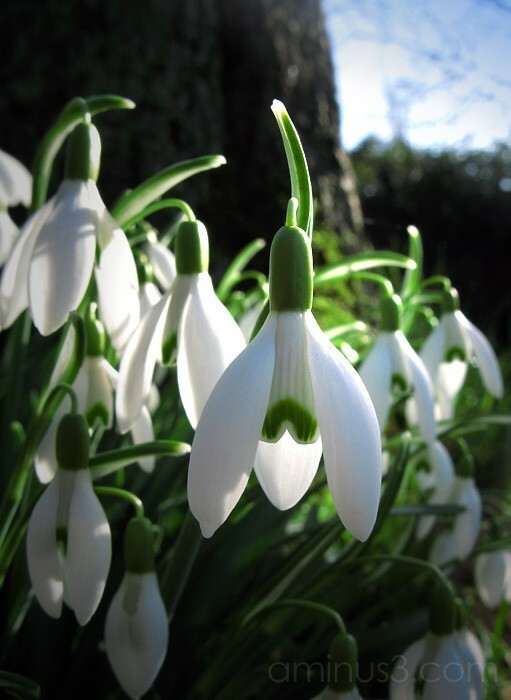 Here is another snowdrop shot, this one in portrait format. Both images were taken on a Canon G7 compact, a gem of a camera in my opinion, as it gives me much the same control as my SLR. I used it in manual exposure mode, and adjusted the exposure in an attempt to try and keep the highlights (on the petals) from 'blowing out', which seems to have worked ok. I also added a little graduated blue to the top right to keep the bright sky from becoming a blank expanse of nothingness. Very pretty; I especially like the light shining through the flowers. I might have scooted over just enough to crop out that bright white/blue patch in the upper right, but that's just me. Another fine shot! You've treated your highlights well. I do prefer yesterday's post (not sure if you are looking for an opinion). I just like the way you handled proportions in yesterday's shot a little better; but, both are fine works! Another amazing shot! I'm not able to choose my favorite between the landscape/portrait. Both have features I like. I think your PP on this shot adds a nice subtle filtering light in that upper right corner. Really beautiful work! I like both shots but am leaning more towards this one. Very very nice, Richard. Your capture of these gorgeous flowers is excellent. Really effective highlights here Richard. Excellent and great doctoring.... it works well. I loved yesterday's posting and I love again this one!!! The light in the tiny flowers is enticing! Both of them are beautiful!